WASHINGTON — Two Republican senators are launching yet another attempt at repealing Obamacare, preparing to offer legislation that would try to bridge one of the key dividing elements of an effort that has twice failed to pass the senate, according to a section-by-section analysis obtained by NBC News. It’s too early to gauge whether or not the approach could muster enough support to pass either the Senate or the House, or even if GOP leadership would take it up, but it's a last-ditch effort by Sens. 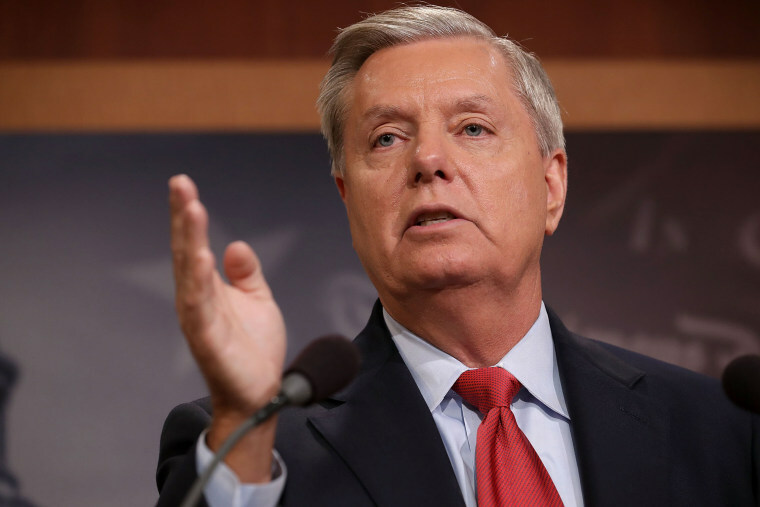 Lindsey Graham, R-S.C., and Bill Cassidy, R-La., to repeal the Affordable Care Act. The 23-page summary draft and an explanation of funding, which Graham's office confirmed is authentic, attempts to achieve parity in federal funding between states that expanded Medicaid and those that did not by 2026. That division was one that helped to kill the Senate's efforts because senators from expansion states tended to oppose the legislation in its previous versions due to the roll-back of the Medicaid expansion. The bill also provides federal money to states to implement their own health care plan as opposed to one system for all 50 states that exists under Obamacare. “A state like Vermont has expressed interest in a state-government run and financed single-payer system like they have in Canada,” Graham said in a press release when he first proposed the idea in July. “If they want to again continue down that path, they would be free to do so under this proposal. South Carolina, on the other hand, would likely go in a different direction and use the federal funding to make private health care more affordable and available. Either way, the state would have a pot of money from the federal government to get the best health care outcomes for their residents." Graham added. The anticipated legislation, which could be unveiled as early as Monday, has been a concept for nearly two months. Graham-Cassidy implements a new funding formula that aims for all 50 states to receive the same "base" funding on a "per-person basis," which would equalize funding for states that didn’t expand Medicaid. Many other components of the legislation are similar to the Better Care Reconciliation Act, the reform legislation the Senate was unable to pass. The core of the legislation unwinds Obamacare starting in 2020, including an end of the Medicaid expansion, and gives states federal funds to implement a state-based health care system. However, it immediately repeals the individual mandate. It also allows states to repeal 1332's, which includes pre-existing conditions and other regulations that mandate the quality of health care and the prohibition of keeping people from accessing health insurance. In exchange, it allows the purchase of a low-cost catastrophic health plan, essentially allowing states to gut patient protections. It also expands the use of health savings accounts and allows people to pay for insurance premiums with the use of HSA funds. The draft gets rid of fewer taxes than previous proposals but includes a repeal of the medical device tax, the tax on over the counter medications and the tax on health savings accounts. It prohibits the use of federal funds on insurance that covers abortion. Preliminary analyses of the bill's reported features by outside groups, like the progressive Center on Budget and Policy Priorities, have suggested that the bill's block grants would dramatically reduce federal health care spending in comparison to current law, especially in states that expanded Medicaid. The new section-by-section analysis acknowledges that some states will receive less money than they do under the ACA. Sens. Lamar Alexander, R-Tenn., and Patty Murray, D-Wash., the chair and ranking member of the Senate Health, Education, Labor and Pensions committee, have been holding hearings and working on legislation to prop up the Obamacare individual market as insurers are weighing not offering coverage in some rural counties across the country. The scaled-down, bipartisan effort is an attempt to shore up Obamacare since Republicans failed to repeal it. The Congressional Budget Office has not yet released a score of the Graham-Cassidy proposal and there's been no indication that Republican leaders are willing to dip back into the health care debate that consumed the first seven months of the Congressional year with no results.